The German cockroach (Blattella germanica) is a small species of cockroach, measuring about .5 inches long; however, they are known to get bigger. It can be tan through brown to almost black, and has two dark parallel streaks running from the head to the base of the wings. Although it has wings, it is unable to sustain flight. 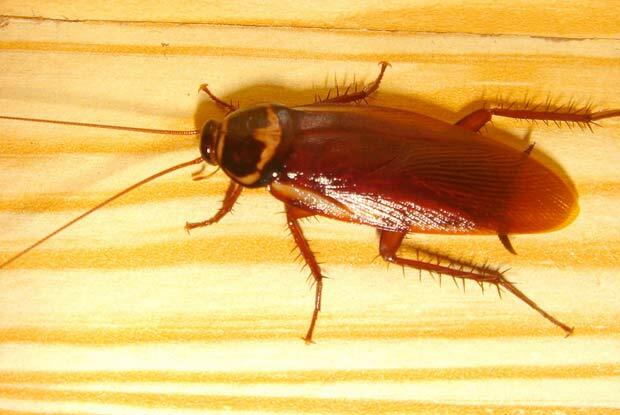 The German cockroach is one of the most common and prominent household cockroaches in the world, and can be found throughout many human settlements. These insects are particularly associated with restaurants, food processing facilities, hotels, and nursing homes. The German cockroach is very successful at establishing an ecological niche in buildings, and is very hardy and resilient against attempts at pest control. This is because of the large number of nymphs produced from each egg case, the short period between birth and sexual maturity, and their ability to easily hide due to their small size. The mother also carries the egg case (called an ootheca) with her during the germination period, rather than depositing it like other species, a practice which would leave them vulnerable in a human habitat to zealous attempts to wipe them out. This cockroach is also smaller than many other species so it can more easily hide and fit into very small cracks and crevices to evade humans. That is also the main reason they can most effectively be controlled with bait in cracks and crevices near harborages. Give us a call today at 503.720.8559 to learn more about German Cockroaches or to schedule an inspection!